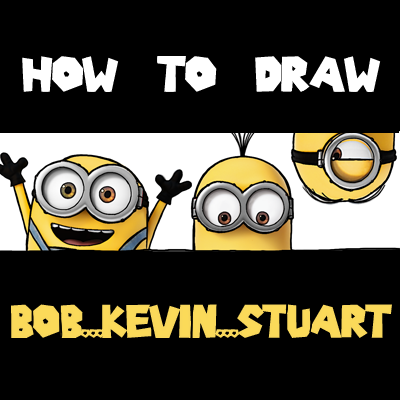 Learn how to draw a cute picture with Bob, Kevin, and Stuart the Minions making cute faces. These cute little guys were so funny in the most recent movie … The Minions Movie. We will guide you thru the easy steps of drawing these cutie pies with the following simple-to-follow steps. Have fun! Draw 2 lines across the page. Draw circles for eyes. The minions that have 2 eyes, look like they have a sideways #8 shape for eyes. Draw circles inside the circles. Minion #1 : Draw lines for arms. Draw a sideways letter ‘D’ shape for the mouth. Draw backwards letter ‘E’ on goggles. Minion #2 & #3 : Draw letter ‘E’ shapes on goggles. Minion #2 : Draw circle in eyes and oval on goggle straps. Minion #3 : Draw circle in eye and oval on goggle straps. Draw curved lines for straps. Minion #1 : Draw fingers. Draw #3 shaped tongue. Draw oval highlights in eyes. Minion #2 : Draw ovals in eyes that form #8-like shape. Minion #3 : Draw ovals in eye that form #8-like shape. Minion #1 : Draw ends of goggle straps. Finish up teeth. Minion #2 : Draw curved lines for hair. Minion #3 : Draw curved lines for hair. Finish up the goggle straps. Darken lines and shade in dark parts. If you wish to, you can color in the minions. Come back soon for more drawing tutorials! This article was written on 03 Sep 2015, and is filled under Despicable Me, The Minions Movie.